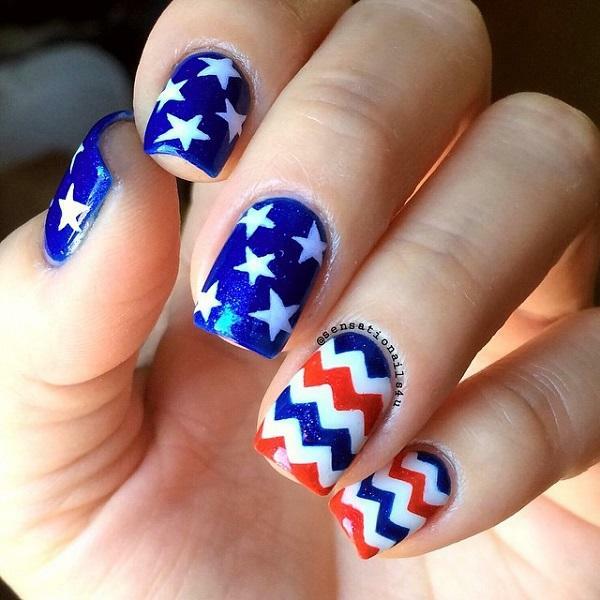 A perfect combination of stars and the colors of the flag, in Chevron style! 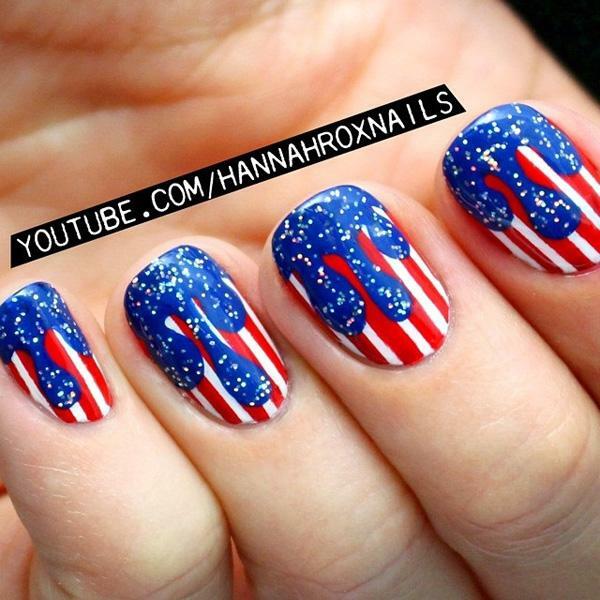 It’s really a fun and beautiful way of celebrating the Fourth of July holiday with the amazing nail art. 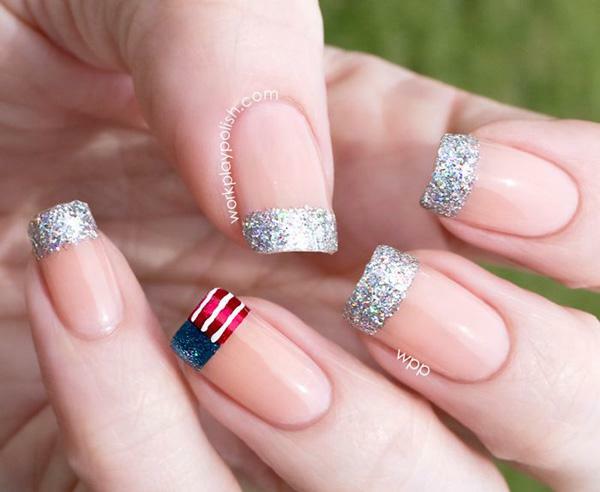 Since nails have become a part of our look, it has also become a big part of our celebrations. New Year? 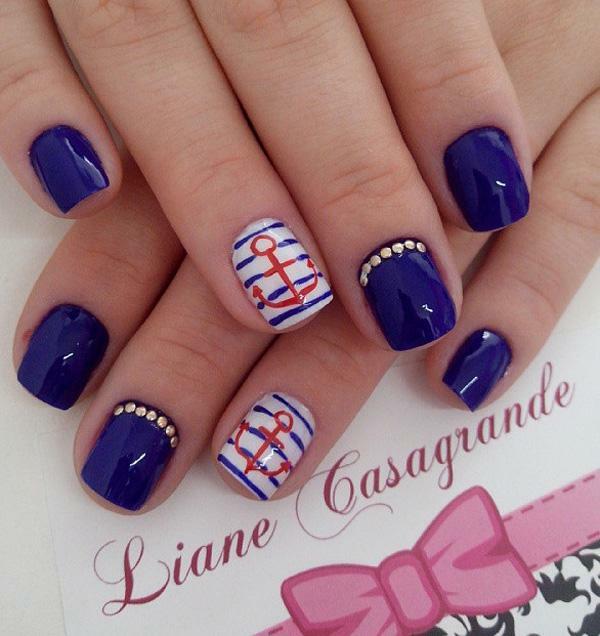 We’ve got the nail art that’s perfect for that. Valentine’s Day? Our nails will complement our whole look. Halloween? Nothing’s scarier than an unadorned nail. Christmas? The holidays are better when we get the nails to match the family sweaters. Even simple date nights, anniversaries, parties, weddings and proms are not complete without nails painted or designed. But there is another celebration that is coming right up. It’s not really a worldwide holiday but it’s definitely known globally and that a lot of people are celebrating. What is it? It’s none other than the independence day of US; the fourth of July. 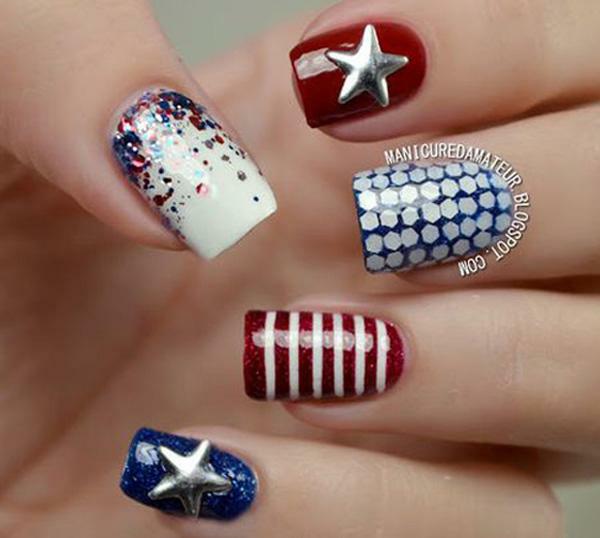 And of course, the best way to help celebrate is to have the whole patriotic vibe. So, getting a nail art design specifically for this event is a great way to be in the moment. Since it’s the fourth of July, our designs are mostly based around the flag of the US. There are the most notable symbol of all: the stars and the stripes. 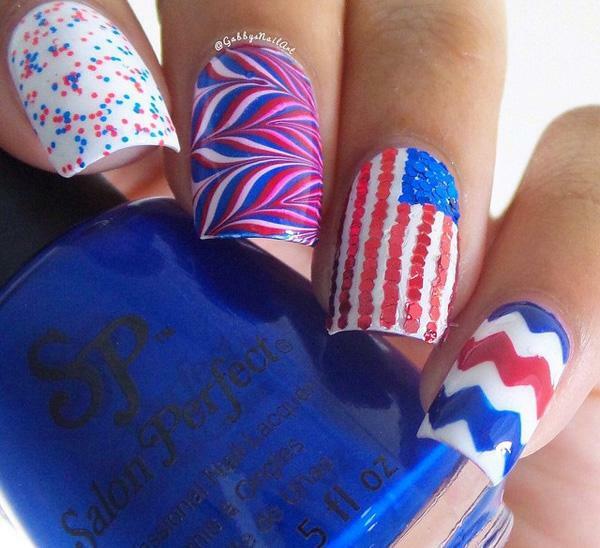 But along with the flag, we would also be witnessing a lot of fireworks inspired nail art designs. It has been a custom to celebrate the day with fireworks so it’s no surprise such designs would also be around. Nonetheless if you’re feeling a little bit creative, you can create other designs that are closely linked with the celebration. The designs you can do is endless as long as you have the imagination and the skills. 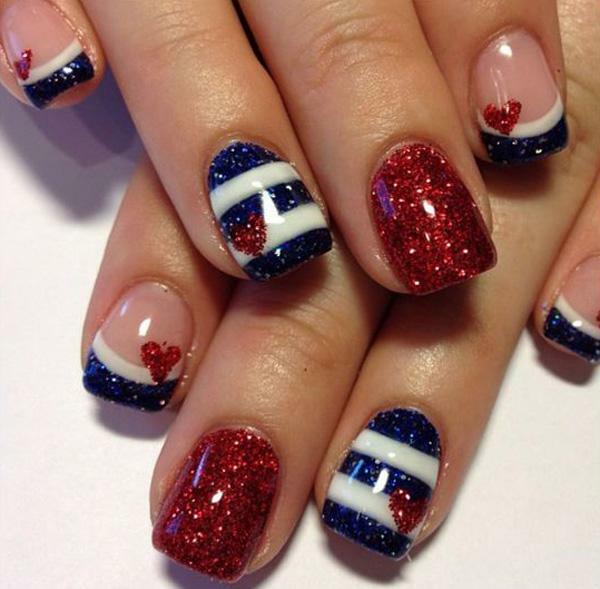 But if you lack the latter (since nail art could really be difficult), you can always find nail salons that offer customized nail art designs. As always, be reminded to protect your nails. A lot of these nail polishes have chemicals that could make your nails brittle or thin. Protecting it would help you keep those healthy and beautiful nails stay that way. And of course, clean nails and fingers would look way better. 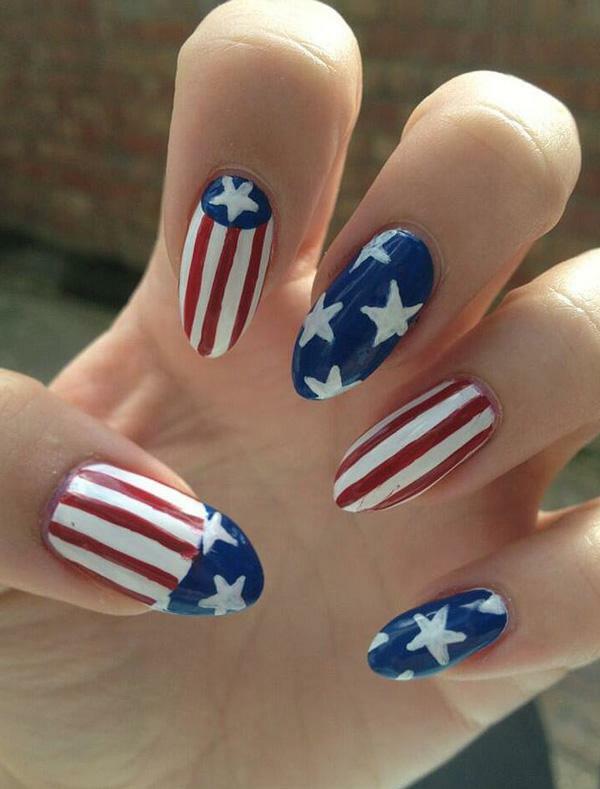 So, cut those nails and cuticles before proudly wearing your stars and stripes! 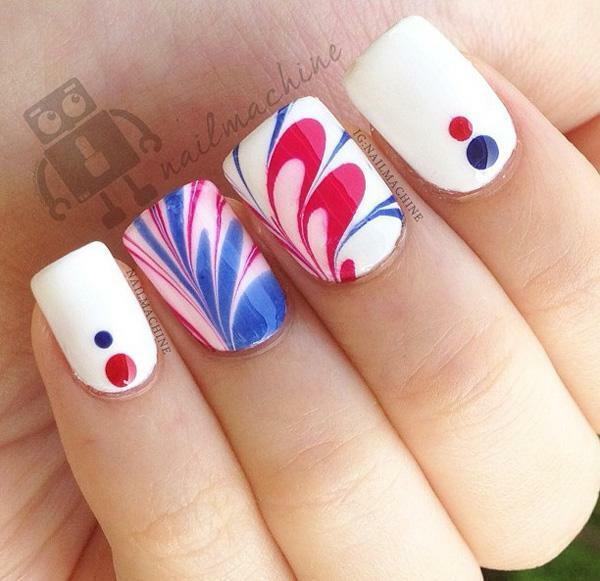 Get a marbled design of the colors of the flag. Plus little dots on a plain white nail isn’t really that bad. It’s perfect for any occasion actually. 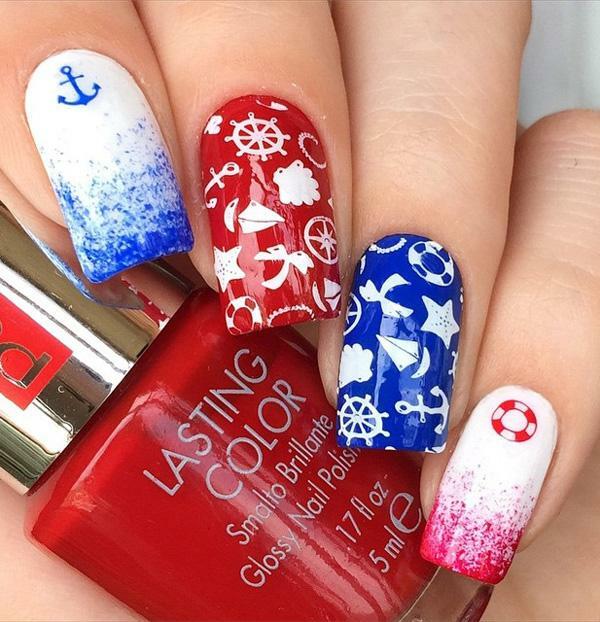 This quirky design is great if you want to commemorate the independence with a fun design. 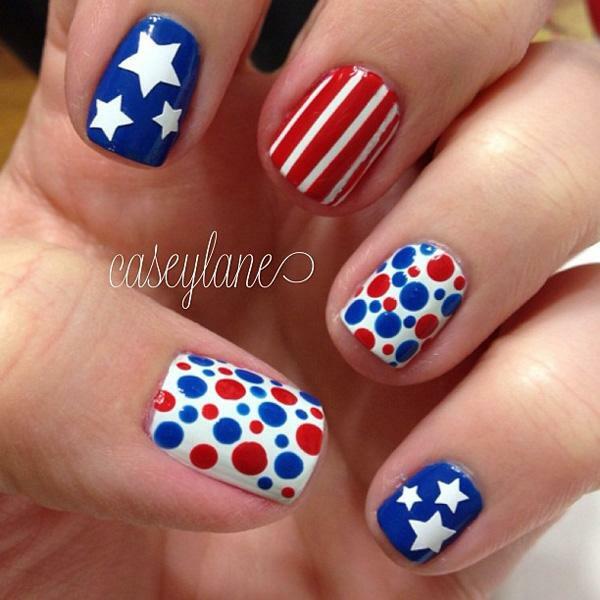 It’s a red and white stripes with “drips” of blue and white polka dots. Again, the color of the flag. 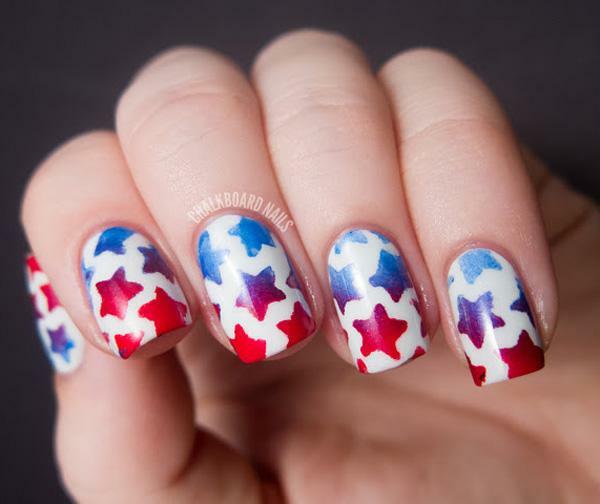 These dazzling and stunning geometric designs in the colors of the flag is just the kind of design that you don’t see often. So for a one-day only big holiday, this is a great design. The recurring stars on blue background and white and red stripes accompanied by red and blue polka dots dots: all a flag-inspired design for the Fourth of July! 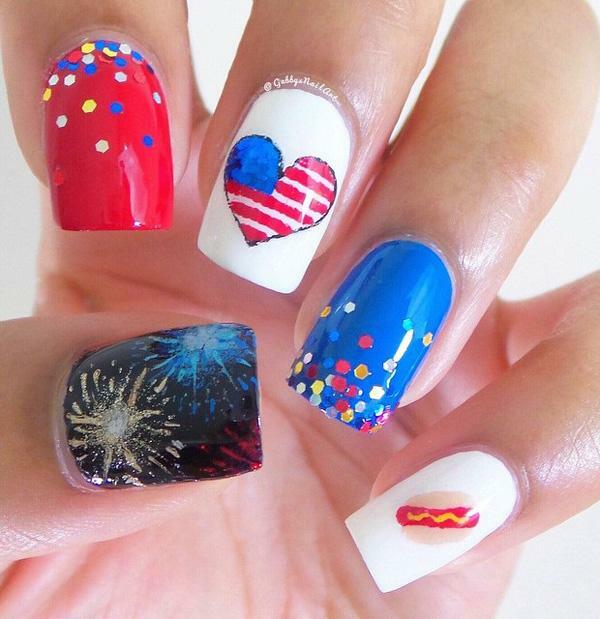 Show your love for the country in a heart-shaped flag, some rhinestones for “confetti”, those fireworks that light up the night sky and of course, the hot dogs from your favorite hot dog stand down the park. 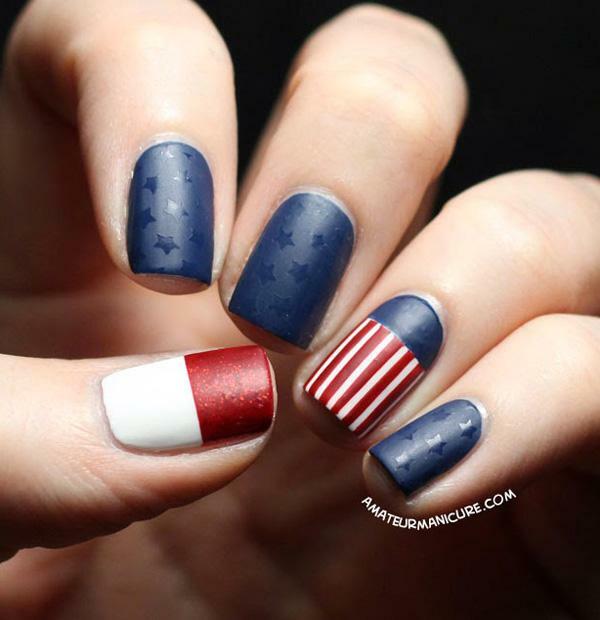 Play with different designs using red, blue and white: the colors of the US flag. 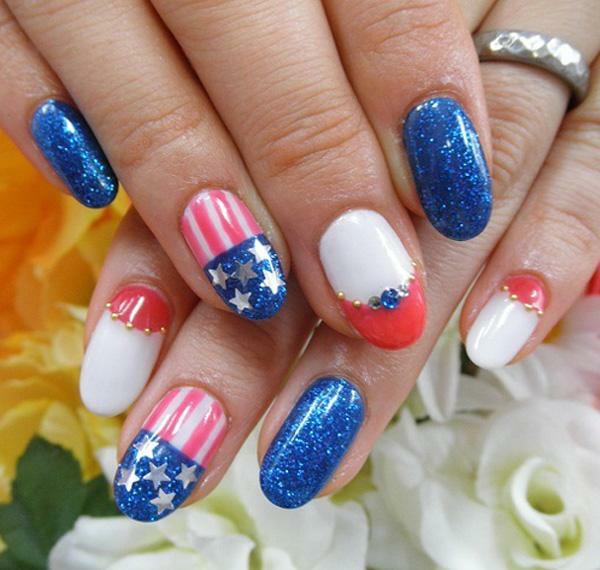 There are little glitters on white nail, marbled design, rhinestones formed like the flag and red, blue and white Chevron pattern. This one is a simple design you can do on your own. you just got to paint your nails white so the colors of the rhinestones will show. 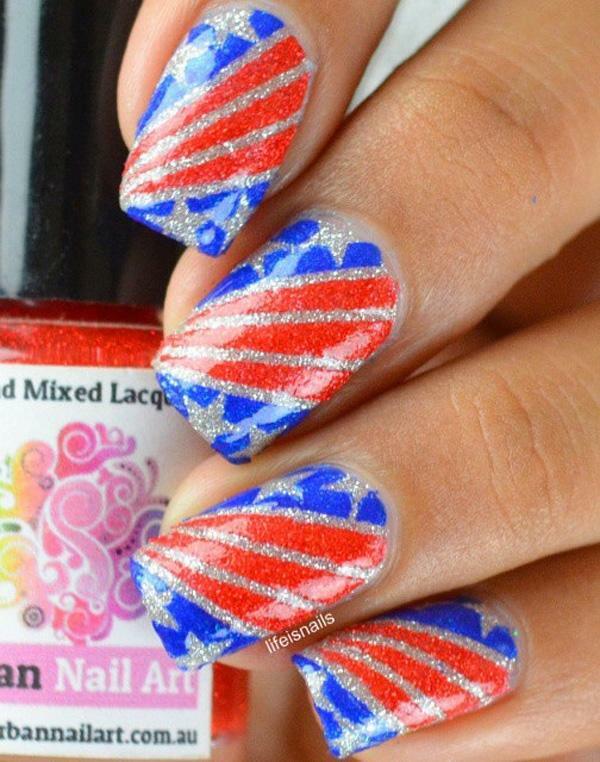 And then put those red and blue rhinestones on the upper corner of your nails. Voila! 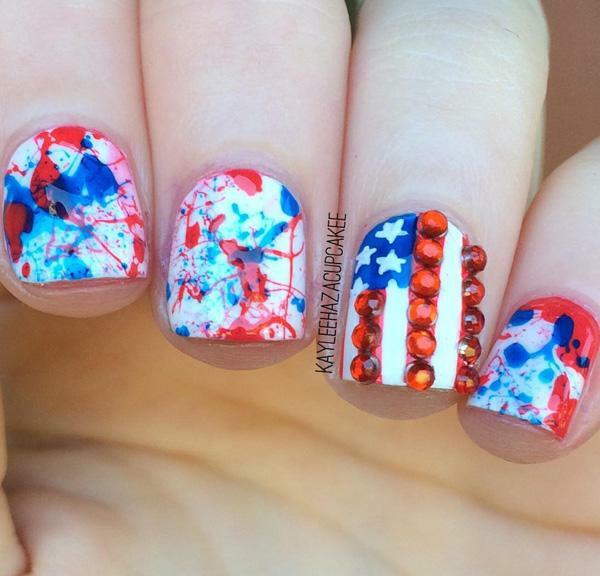 A Fourth of July inspired design. Nothing can make you feel more proud of your country by wearing it. In your nails. Spent time and effort for this and totally a design to be proud of! A couple of marbled design is already enough if you don’t want to overdo it. You can simply leave your two white nails on its own. 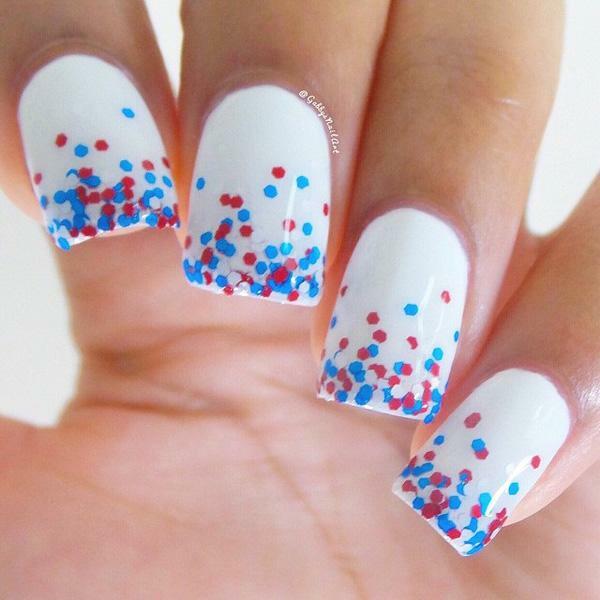 Here’s another simple design for the fourth of July: simply divide your nails into four spaces and fill each one up with a color from the flag. The silver is for added shine. And you can add rhinestones to make it even more dazzling. Salute to the coast guards who helped fight for our freedom. 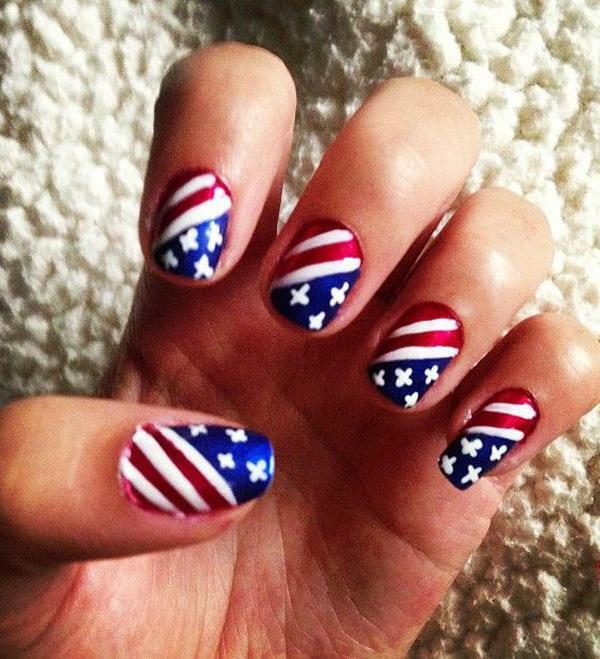 Here’s a Fourth of July design especially for them. Matte nail polishes are the trend these days. you could see why with its classy look. 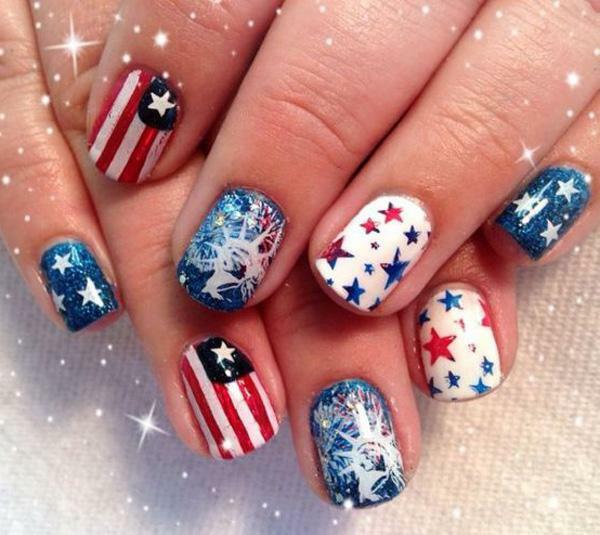 It’s definitely great for these blue nail polish with stars and then the flag one finger. 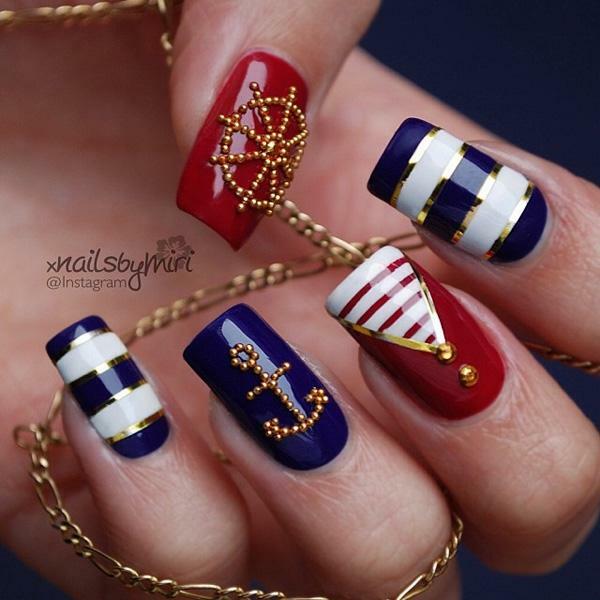 Another love for the sailors with this design. 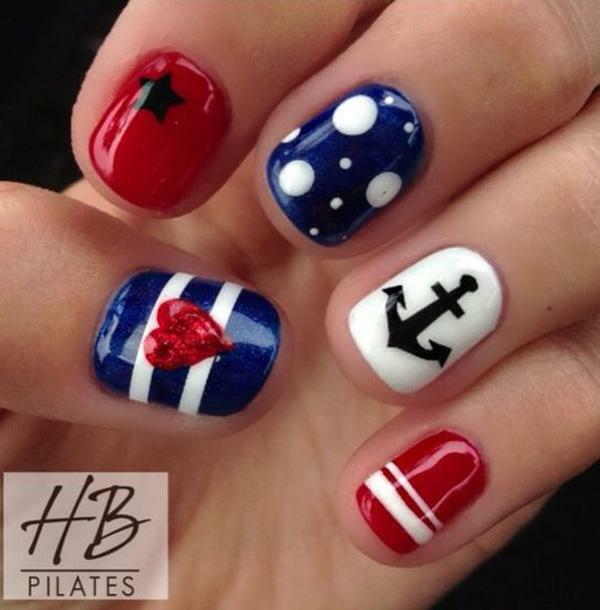 Thank the sailor in your life with this design inspired for them. The metallic gold outline makes it look stunningly glamorous along with the gold beads forming an anchor and wheel. 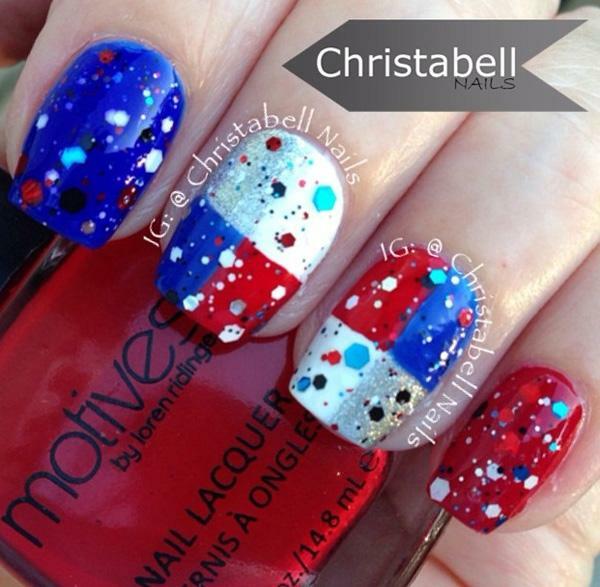 Make some flag-inspired french tips in this sassy design inspired by the Fourth of July. 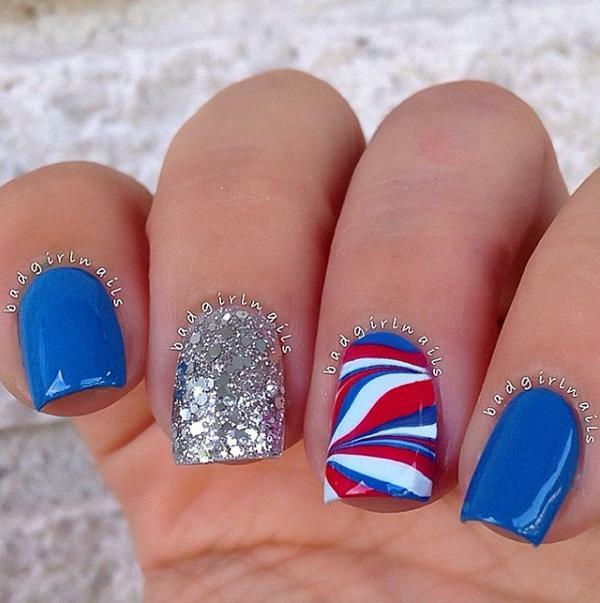 Use a blue glitter nail polish to make it look more appealing. 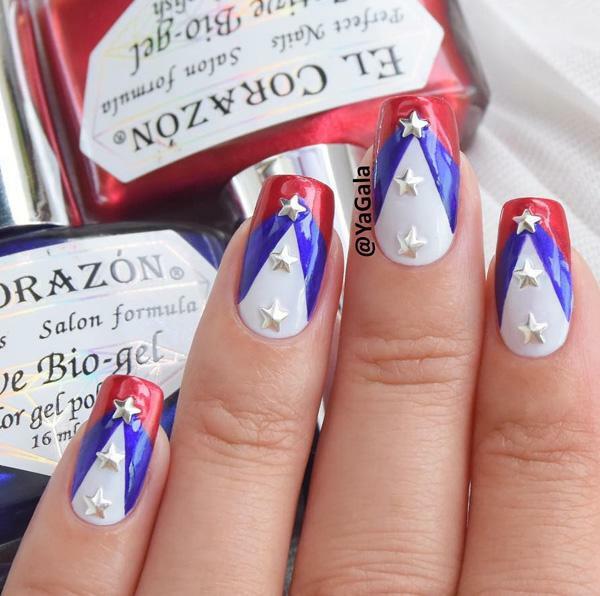 Instead of white stars, you can create an ombre of red and blue stars. All you have to do is find a stencil of stars and then create an ombre color using a sponge. White is usally the base color since it can make the colors pop out more. But you can always go for a red background to make your design appear stronger and bolder. Just like what people in the past have done to achieve freedom. The challenge with this one is creating the accent which is the US heart flag. But the rest could be made easily at home on your own. Just make you have the silver glitter and rhinestone nail polish. Stars and stripes. The usual. But if you combine it with a fireworks and Statue of Liberty design, it would be simply unique and beautiful. These are the simplest design but probably the most classic one: the french tip. 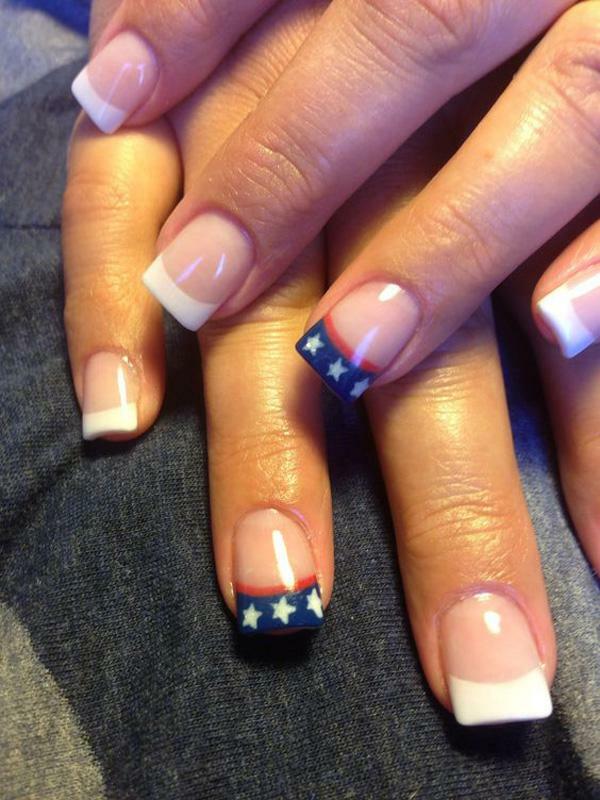 But instead of going with a simple white tip, you can play with it and create a flag-inspired tip. 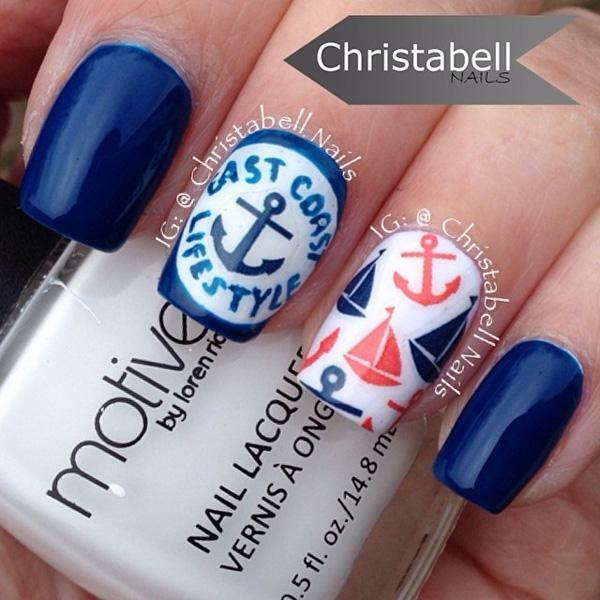 A girly girl version of flag inspired designs to still make your design more personalized. 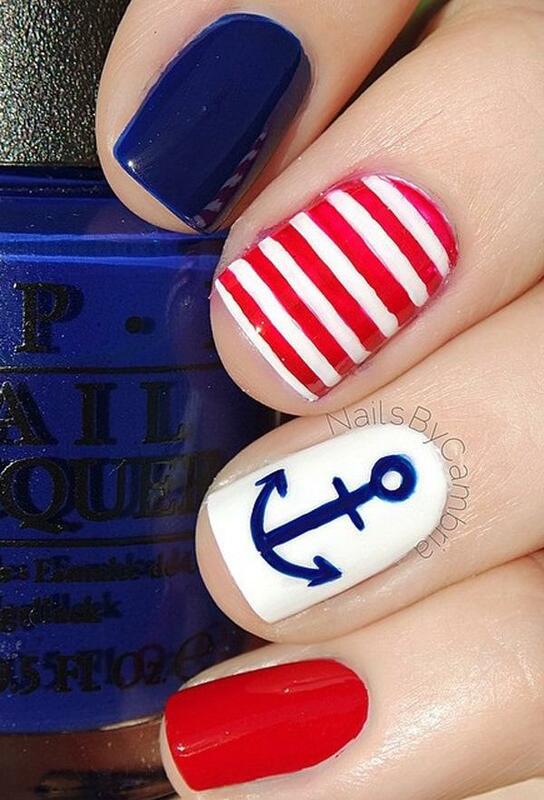 Cute stars and stripes for the US flag and some anchors for the accent design. If you find a good nail salon who can help you with this, then it’s much better to get their help since the design could be a bit tricky especially when you don’t have the tools. 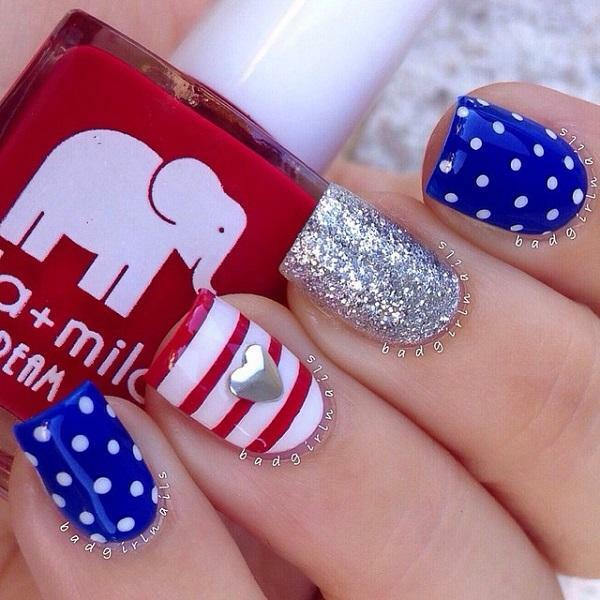 You will need blue and red little rhinestones, silver big ones and big silver stars to recreate this look. But the result is awesome and perfect for the holiday. Create a red and white base and then stars and blue background for the tip. It’s a different take on the classic french tip but with the same classy effect. 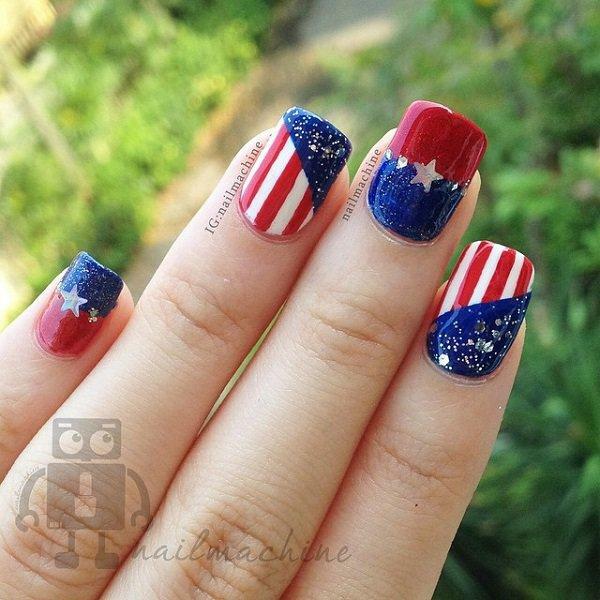 But this time, it also has a patriotic vibe. Be the real American Girl in this classic blue and white stars and red and white stripes. The challenge however is to recreate the long slender shape of the nails. But you can still do the design without that. Another variation of the flag inspired designs. 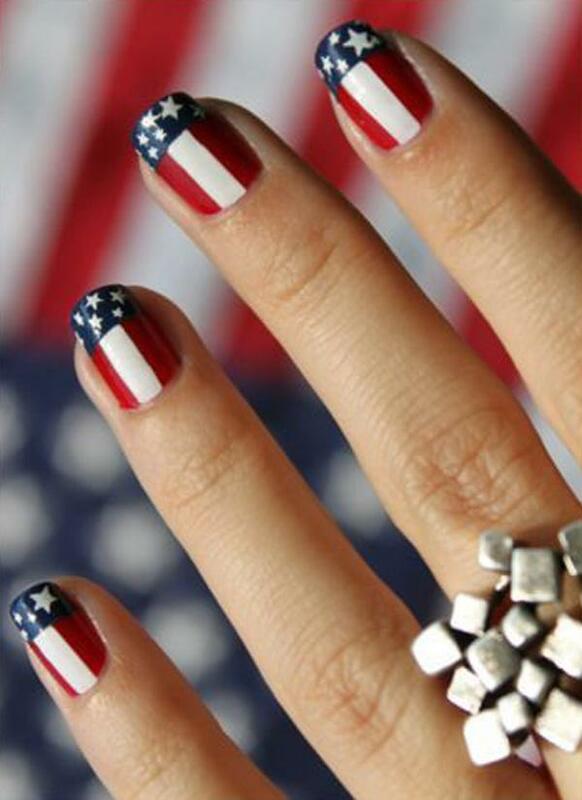 But this one can be easily created in your own home since there isn’t the need for sharper looking stars or stripes. Stars can be quite hard to do especially when you really aren’t the artsy type. So what you can do is use silver glitters to help make your flag twinkle like in this one. 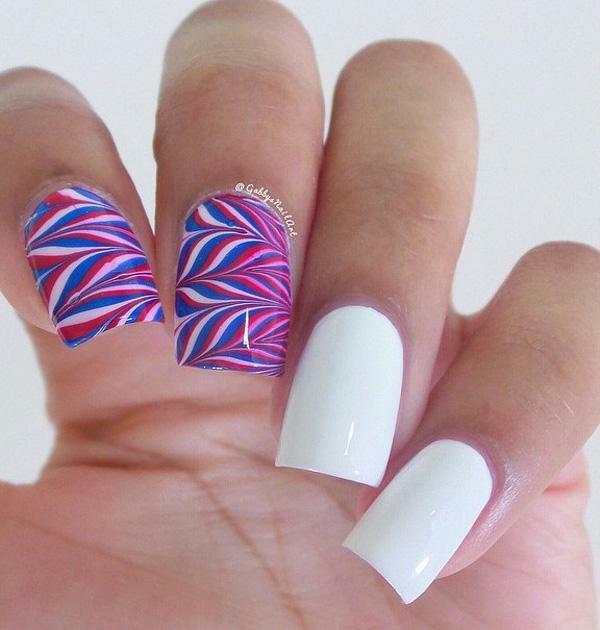 And you may notice that the colors are and designs are inverted on the other nails so that it won’t look boring. 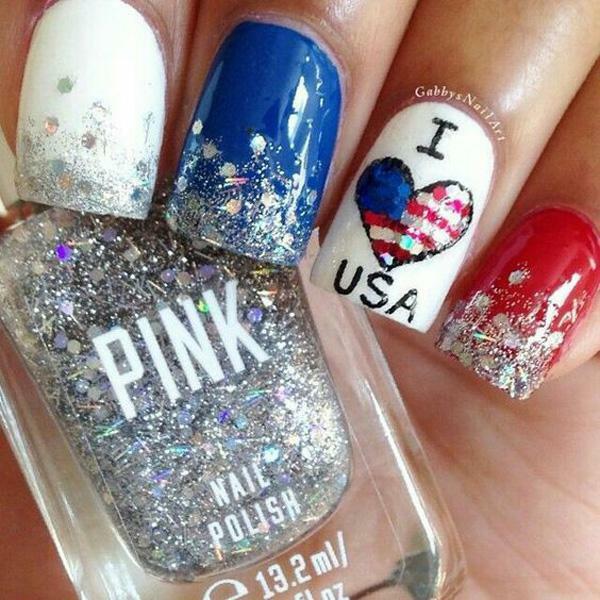 Red and blue glitter nail polishes will give your flag-inspired design a sassy vibe. 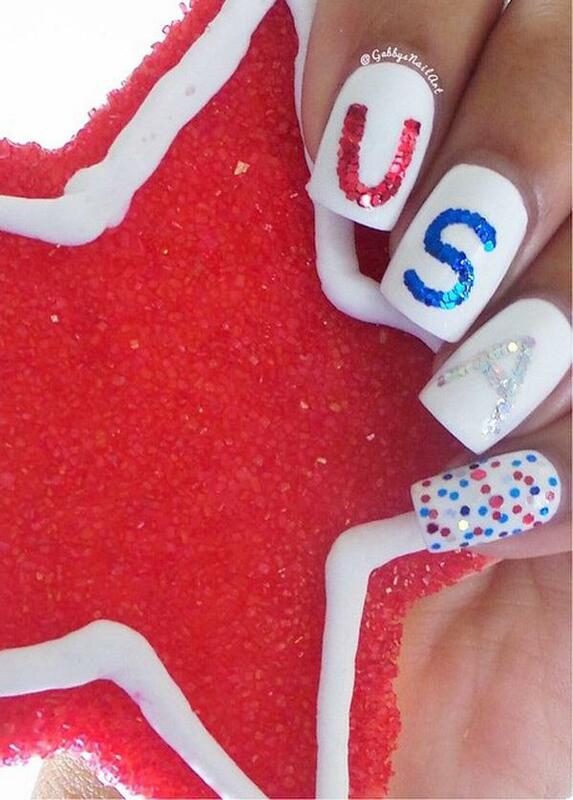 So even when you’re still celebrating with the whole nation, you still show your personality with your nails. If you are tired of the classic white french tips, you can always go with silver tips for added fab effect. 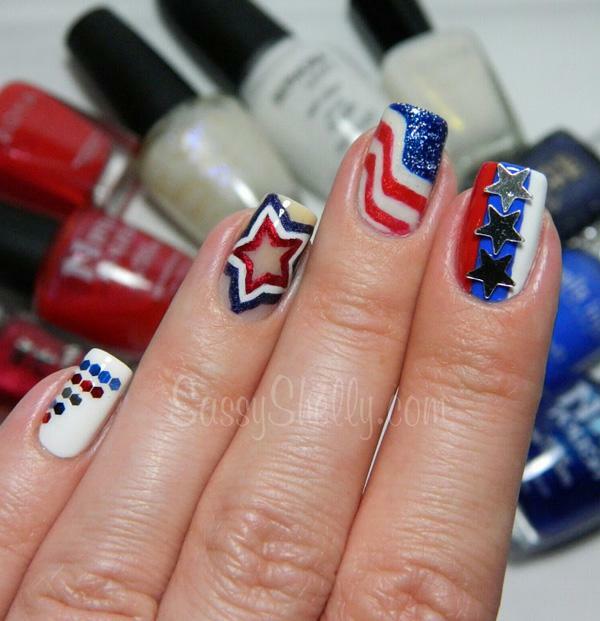 But since you want to celebrate the Fourth of July, a flag inspired tip would also do the work. This one is much the same as the previous example. 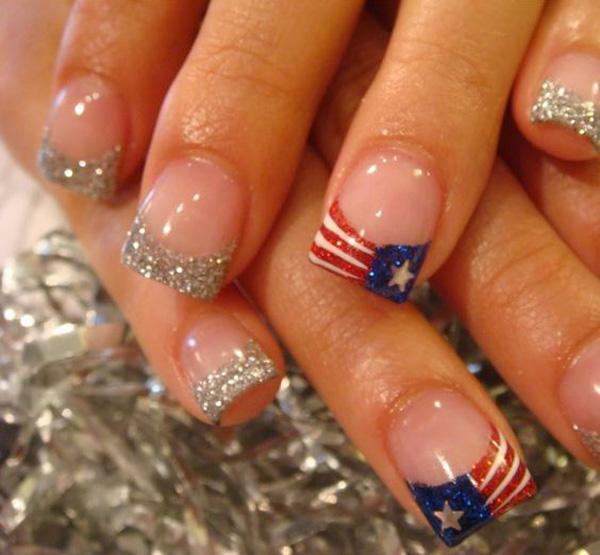 However, the silver tips are more bold and instead of merely glitters, metallic nail polish is also used for the flag. It gives the color a much better appeal. Show more of your artistic side by creating various designs using the colors of the flag. From rhinestones, to stars and wavy flags to funky but sassy silver star rhinestones on a blue, red and white background. 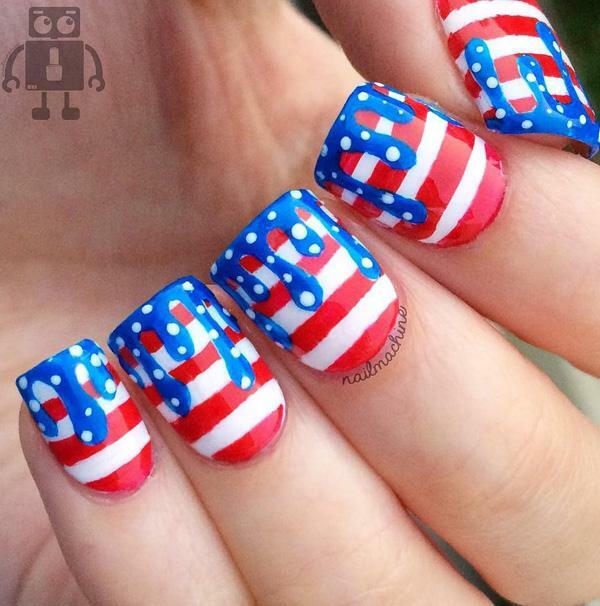 This cute design may not really be as showy of your patriotism. It could be just another design you want to rock. But sometimes, it doesn’t have to be. As long as you know what it means and it looks good, then go for it. Marbled designs are becoming the rage now. So start getting in the bandwagon by this flag inspired marbled design. And you don’t really have to do it on all your nails now. Glitters and plain nail polishes look great too. 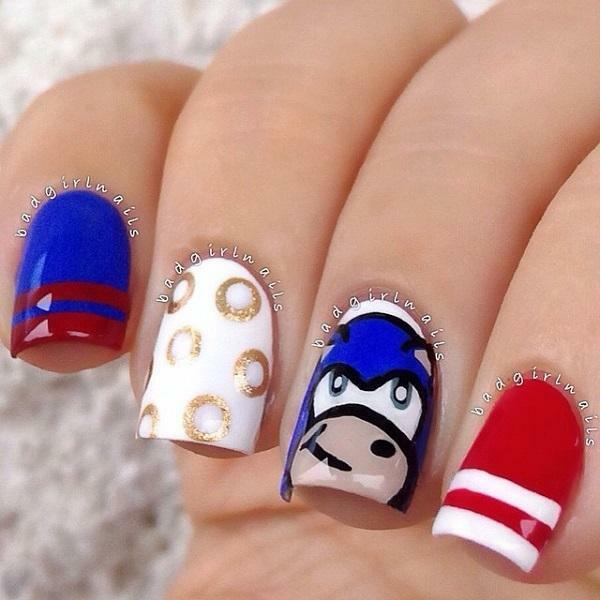 This could mean two things at a time: colors representing the flag and your love for Sonic. Getting all glittery and sparkly isn’t so bad. 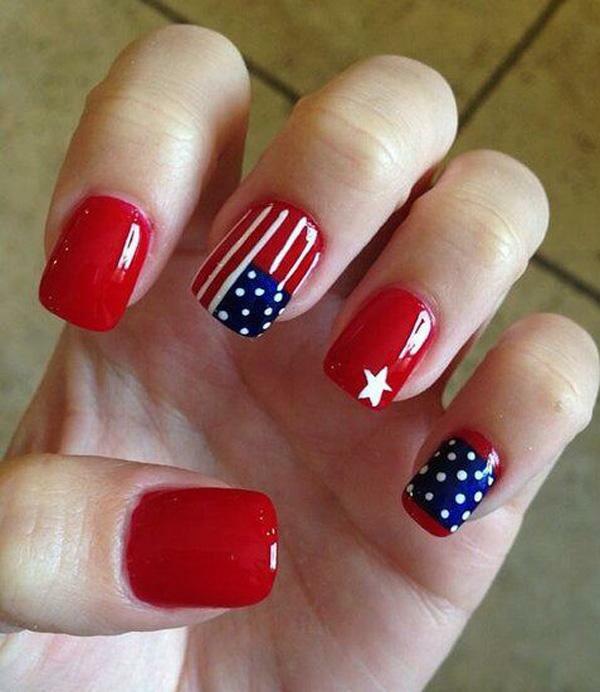 It’s like having the flag in your nails as well as mimicking the flashy fireworks at the Fourth of July celebration. This could look quite tricky but you really can do it on your own. Use a red and white matte for the base and then a star stencil would help you make the job easier. 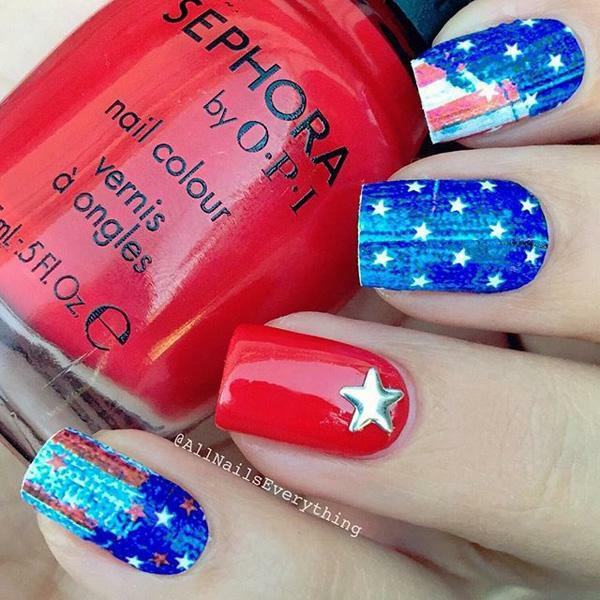 Or you can create stars using a scotch tape and then cover with blue matte nail polish. Sometimes, you just have to go with the simple ones. Like this design. Simple yet eye catching. These lovely designs are hard to do manually. 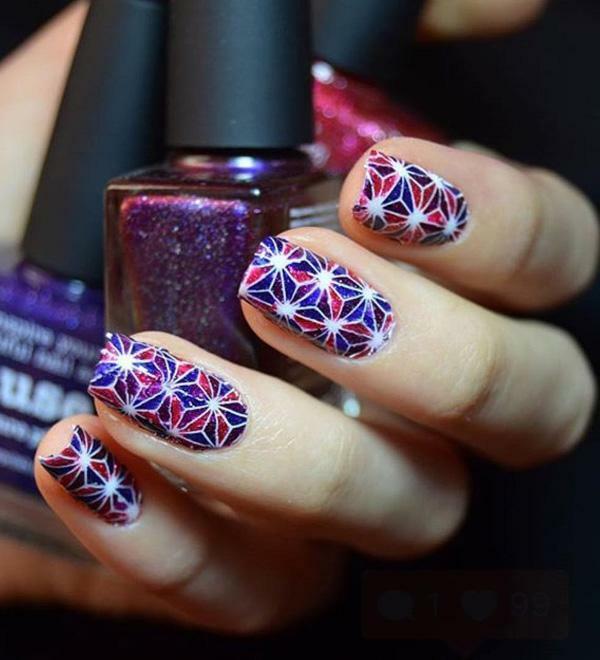 But thanks to nail art accessories and sets, you can easily do this even on your own. The key is finding the best sets you can. Another form of marbled design that you can do. 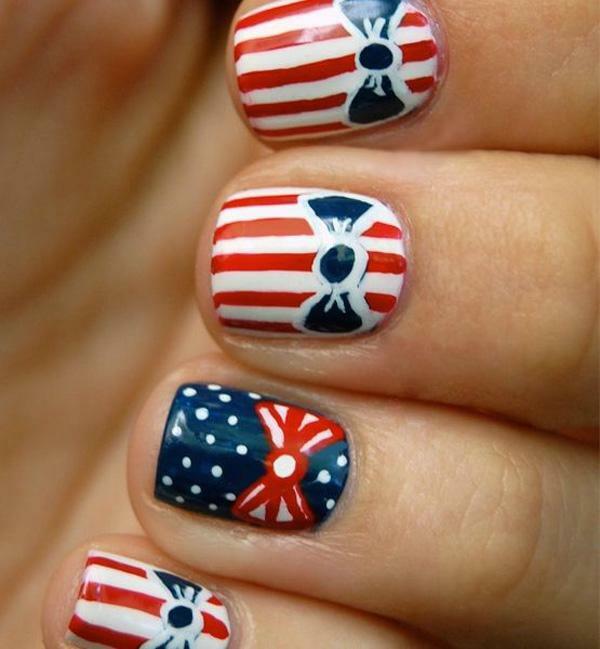 But apart from that, include a flag-inspired design to commemmorate the event. This one is much the same with an earlier entry, but here, the “drips” are bigger. So it gives an entirely different appeal. 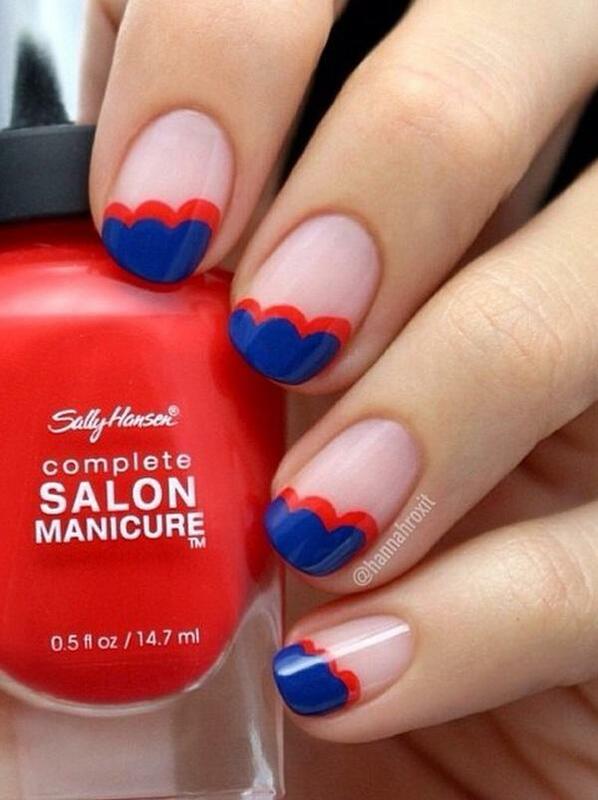 These cute little red and blue tips are very simple and yet comes out strong and bold. Plus these can be easy to make! These “fades” are rather hard to reciprocate when you’re a first timer. But with practice and watching more tutorials, it would come easy in time and will look as great as this one. 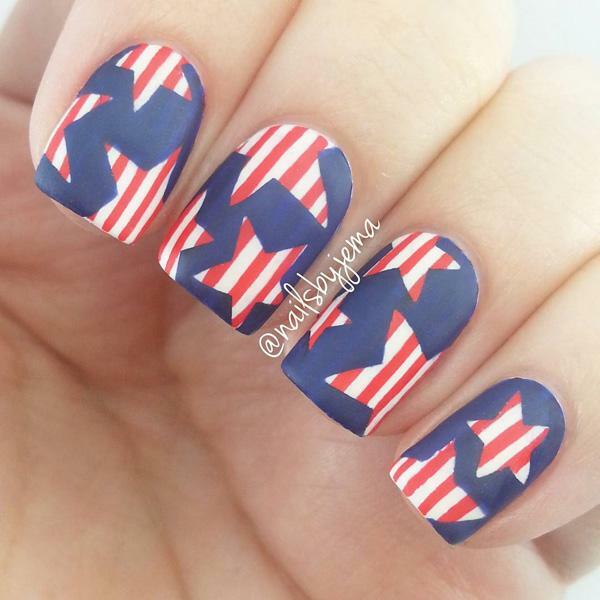 These glamorous Chevron nails in the color of the flag can be easily done. You just have to find some little stars that you can add to make the design complete. 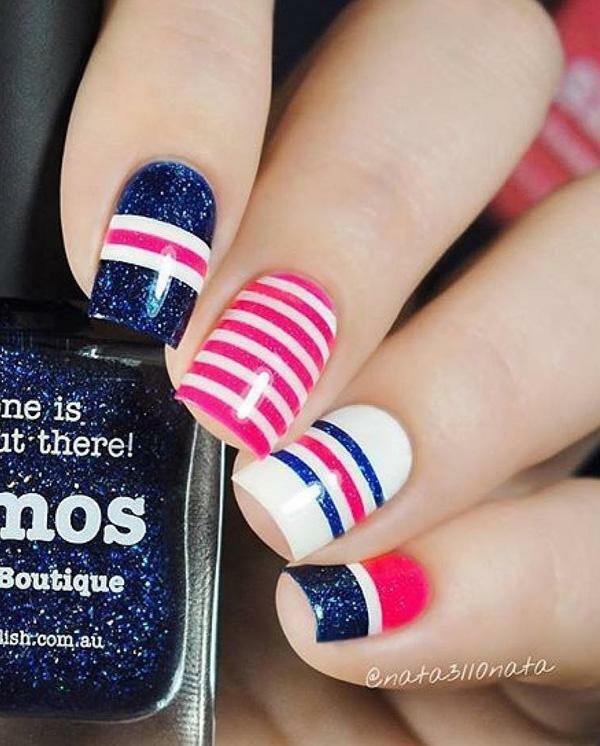 Stripes are one of the most popular and easiest nail art designs that can help you celebrate any holiday or event; including Fourth of July. And here’s a proof it works.